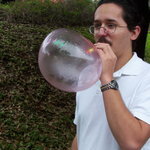 So we went to Toy Joy, and Jonathan got this weird stuff that you blow bubbles with, but it ends up being kinda like a balloon. Weird, but cool! After that we went to the new Whole Foods downtown - here it is in all of its glory. 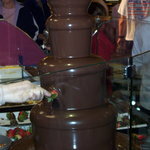 They even have a chocolate fountain that they dip stuff in! David, Barbara and Jonathan in front of the walk-in beer cooler. Doug and Lucas at Jonathan's gamenight. Now on to Houston pictures. 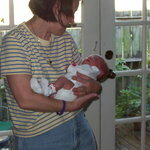 Here's Mom holding Ed's new baby, Julia. Ed and his wife with Julia. 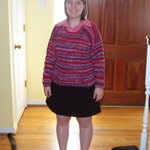 Jessi with her new sweater. Looking sharp! 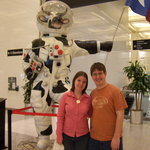 Jessi and I, before she flew out of Intercontinental Airport, in front of a space cow. Yeah, I don't know, either.